226 pages | 3 B/W Illus. Examined from a non-Western lens, the standard International Relations (IR) and Foreign Policy Analysis (FPA) approaches are ill-adapted because of some Eurocentric and conceptual biases. These biases partly stem from: first, the dearth of analyses focusing on non-Western cases; second, the primacy of Western-born concepts and method in the two disciplines. That is what this book seeks to redress. Theorizing Indian Foreign Policy draws together the study of contemporary Indian foreign policy and the methods and theories used by FPA and IR, while simultaneously contributing to a growing reflection on how to theorise a non-Western case. Its chapters offer a refreshing perspective by combining different sets of theories, empirical analyses, historical perspectives and insights from area studies. Empirically, chapters deal with different issues as well as varied bilateral relations and institutional settings. Conceptually, however, they ask similar questions about what is unique about Indian foreign policy and how to study it. The chapters also compel us to reconsider the meaning and boundary conditions of concepts (e.g. coalition government, strategic culture and sovereignty) in a non-Western context. 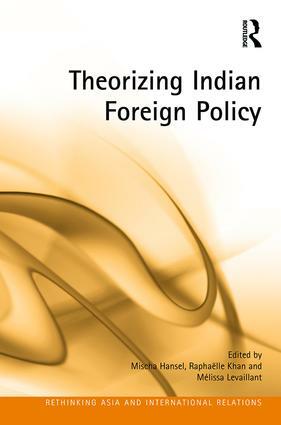 This book will appeal to both specialists and students of Indian foreign policy and International Relations Theory. Mischa Hansel is an Assistant Professor (Wissenschaftlicher Mitarbeiter) at the RWTH Aachen University. Previously he worked at the Justus Liebig University Giessen and the University of Cologne where he obtained his Ph.D in 2012. Several of his works deal with the question of whether or not liberal and constructivist FPA approaches are suitable to the study of Indian foreign policy. Recent articles appeared in Global Change, Peace & Security and Asian Politics and Policy respectively. Other research interests include the norms and discourses guiding decisions on military interventions, Western and Non-western military transformation processes, arms control regimes, and German foreign policy. Raphaëlle Khan is a PhD candidate in History/International Politics at King’s College London. Her work focuses on India’s emergence as an international sovereign actor between the 1920s and the 1960s, through an analysis of Indian understandings of sovereignty. She holds a double Master’s Degree in European Studies from the London School of Economics and Political Science (LSE) and the Institut d’Etudes Politiques de Paris (Sciences Po). Her research interests include India’s diplomacy in multilateral arenas, International Organisations, International Politics of South Asia, Rising Powers, and Europe-India relations. Mélissa Levaillant is a Researcher at the Institute of Strategic Research (IRSEM) of the French Ministry of Defence. She obtained her PhD from Science Po Paris in 2016, where she teaches World Politics and South Asian Security. Her dissertation was on the institutionalisation of India's ministry of External Affairs, from 1947 to 2015. Her other main research interests include India's foreign policy towards the Middle East and security issues in the Indian Ocean. In 2012, she published a book on India's foreign policy towards Iran.